BORDERS THE NATIONAL FOREST! 20 ACRES WITH ASPENS! Only 25 miles from Yellowstone National Park!! THIS IS GREAT BIG GAME COUNTRY-- elk, moose, bear, deer, grizzlies, wolves and even mountain goats and bighorn sheep on the peaks above this land. It is just 25 miles from YELLOWSTONE NATIONAL PARK and even closer to 1000'S OF ACRES OF WILDERNESS!! Great property in an area known for lots of hunting, fishing and recreation. Just a few miles north of the Idaho state line and Henry's Lake, it is also just a few miles south of the Madison River and Quake Lake. 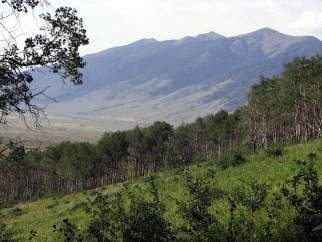 This property borders the National Forest and is at the foot of the Henry Mountains. Power is less than a mile away, but phone is 200 feet from the property. The state highway is 1.8 miles to the west. About 25% of the property has aspen trees on it and several nice elevated building sites on the side hill. Most of the property is sloped with a west facing slope.